406 pages | 55 B/W Illus. Globally, 30% of the world population lived in urban areas in 1950, 54% in 2016 and 66% projected by 2050. The most urbanized regions include North America, Latin America, and Europe. Urban encroachment depletes soil carbon and the aboveground biomass carbon pools, enhancing the flux of carbon from soil and vegetation into the atmosphere. Thus, urbanization has exacerbated ecological and environmental problems. Urban soils are composed of geological material that has been drastically disturbed by anthropogenic activities and compromised their role in the production of food, aesthetics of residential areas, and pollutant dynamics. Properties of urban soils are normally not favorable to plant growth—the soils are contaminated by heavy metals and are compacted and sealed. Therefore, the quality of urban soils must be restored to make use of this valuable resource for delivery of essential ecosystem services (e.g., food, water and air quality, carbon sequestration, temperature moderation, biodiversity). Part of the Advances in Soil Sciences Series, Urban Soils explains properties of urban soils; assesses the effects of urbanization on the cycling of carbon, nitrogen, and water and the impacts of management of urban soils, soil restoration, urban agriculture, and food security; evaluates ecosystem services provisioned by urban soils, and describes synthetic and artificial soils. Urban soils are composed of geological material that has been drastically disturbed by anthropogenic activities and compromised their role in the production of food, aesthetics of residential areas, and pollutant dynamics. Properties of urban soils are normally not favorable to plant growth?the soils are contaminated by heavy metals and are compacted and sealed. Therefore, the quality of urban soils must be restored to make use of this valuable resource for delivery of essential ecosystem services (e.g., food, water and air quality, carbon sequestration, temperature moderation, biodiversity). Part of the Advances in Soil Sciences Series, "Urban Soils" explains properties of urban soils; assesses the effects of urbanization on the cycling of carbon, nitrogen, and water and the impacts of management of urban soils, soil restoration, urban agriculture, and food security; evaluates ecosystem services provisioned by urban soils, and describes synthetic and artificial soils. Knowledgeably compiled and co-edited by Rattan Lal, (Distinguished University Professor of Soil Science and Director of the Carbon Management and Sequestration Center, The Ohio State University) and B.A. Stewart (Director of the Dryland Agriculture Institute and a distinguished professor of soil science at West Texas A&M University, Canyon, Texas), "Urban Soils" is comprised of eighteen deftly organized and presented articles by experts in the field, making it unreservedly recommended for professional, corporate, governmental, and academic library Agricultural Science collections in general, and Soil Sciences supplemental studies reading lists in particular. 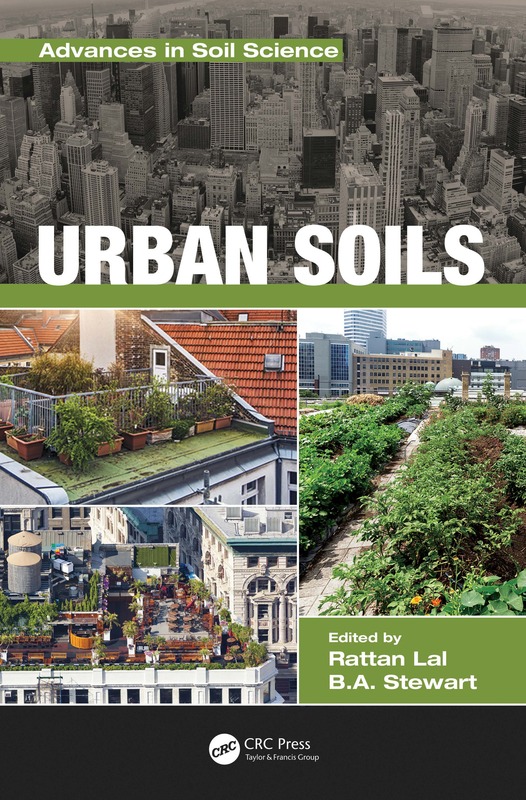 It should be noted for students, academia, and non-specialist general readers with an interest in the subject that "Urban Soils" is also available in a digital book format (Kindle, $151.07). Rattan Lal, Ph.D., is a Distinguished University Professor of Soil Science and Director of the Carbon Management and Sequestration Center, The Ohio State University, and an Adjunct Professor of University of Iceland. His current research focus is on climate-resilient agriculture, soil carbon sequestration, sustainable intensification, enhancing use efficiency of agroecosystems, and sustainable management of soil resources of the tropics. He received honorary degree of Doctor of Science from Punjab Agricultural University (2001), the Norwegian University of Life Sciences, Aas (2005), and Alecu Russo Balti State University, Moldova (2010). He was president of the World Association of the Soil and Water Conservation (1987-1990), the International Soil Tillage Research Organization (1988-91), the Soil Science Society of America (2005-2007), and is President Elect of International Union of Soil Science. He was a member of the Federal Advisory Committee on U.S. National Assessment of Climate Change-NCADAC (2010-2013), member of the SERDP Scientific Advisory Board of the US-DOE (2011-), Senior Science Advisor to the Global Soil Forum of Institute for Advanced Sustainability Studies, Potsdam, Germany (2010-), member of the Advisory Board of Joint Program Initiative of Agriculture, Food Security and Climate Change (FACCE-JPI) of the European Union (2013-), and Chair of the Advisory Board of Institute for Integrated Management of Material Fluxes and Resources of the United Nation University (UNU-FLORES), Dresden, Germany (2014-2017). Prof. Lal was a lead author of IPCC (1998-2000). B.A. Stewart is Director of the Dryland Agriculture Institute and a distinguished professor of soil science at West Texas A&M University, Canyon, Texas. He is a former director of the USDA Conservation and Production Laboratory at Bushland, Texas; past president of the Soil Science Society of America; and member of the 1990-1993 Committee on Long-Range Soil and Water Policy, National Research Council, National Academy of Sciences. He is a fellow on the Soil Science Society of America, American Society of Agronomy, Soil and Water Conservation Society, a recipient of the USDA Superior Service Award, a recipient of the Hugh Hammond Bennett Award of the Soil and Water Conservation Society, an honorary member of the International Union of Soil Sciences in 2008. In 2009, Dr. Stewart was inducted into the USDA Agriculture Research Service Science Hall of Fame . Dr. Stewart is very supportive of education and research on dryland agriculture. The B.A. and Jane Ann Stewart Dryland Agriculture Scholarship Fund was established in West Texas A&M University in 1994 to provide scholarships for undergraduate and graduate students with a demonstrated interest in dryland agriculture. Scholarship Fund was established in West Texas A&M University in 1994 to provide scholarship for undergraduate and graduate students with a demonstrated interest in dryland agriculture.